San Francisco International airport (SFO) is located 13 miles south of downtown San Francisco, CA, accessible via the Bay Area Rapid Transit rail. SFO is the second busiest airport in the State of California (after LAX), the tenth busiest in the United States, and the twentieth largest airport in the world. SFO is also the fifth largest hub airport for United Airlines, which recently became the world’s largest carrier after merging with Continental. New startup low-cost carrier Virgin America also bases its principle operations at SFO. United and its regional affiliates operate approximately 45.5% of the market share into and out of SFO, but one of the more unique aspects about SFO is that it is served by a broad range of carriers: domestic US airlines (full-service, regional and low-cost), as well as transborder, Asian, South Pacific, Latin America, European and Middle Eastern ones. Of the 37 total airlines that fly into SFO, 29 of them are international. 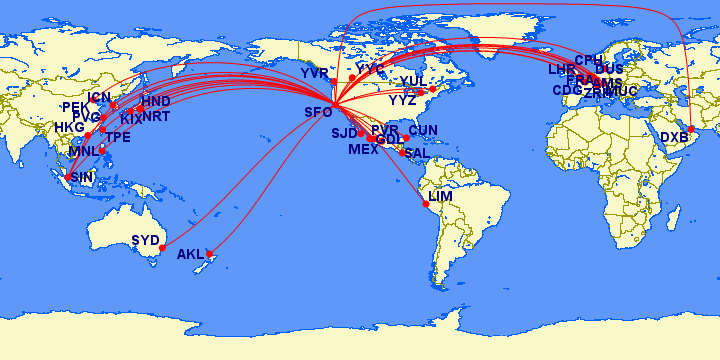 Route map of the international services operating out of SFO. The longest route is to Dubai, served daily on Emirates. The busiest international route is to London Heathrow, followed by Hong Kong and Seoul. SFO’s newest international route will be to Copenhagen, which will launch in April 2013 via SAS) as well as two new United routes to Paris and Tapei. Roughly a third of the foreign traffic flying into SFO hails from North East Asia, but slightly less than a third also comes in from Western Europe – a remarkable factor given that California historically has stronger ties with the Far East being on the west coast. One can imagine the technology and research bubble in the Bay Area accounts for this high level of demand. SFO has two parallel runways, separated by only 750 feet between the centerlines of the runway pairs. This often causes flow-control problems due to the temperamental nature of the weather conditions in the Bay Area which usually involve low-visibility conditions for pilots. As such, often times only two of the runways are operational at a time, which means that flow control issues are commonplace. In the past, this caused many airlines to flee SFO in favor of smaller, less congested airports in the Bay Area such as San Jose Norman Mineta airport in the South Bay region or Oakland International airport over in the East Bay. However, the facility upgrades at SFO, along side its convenient accessibility from the higher-revenue paying neighborhoods in the area, have caused many airlines to flock back to the airport in recent years. Southwest made a notable return in 2006, and other entrants such as JetBlue and Virgin America have found success at SFO despite operating under a low-cost model.